The purpose to honor design excellence. MORRISTOWN, NJ – Clawson Architects, LLC was awarded both a Gold and a Silver medal for design achievements from the American Institute of Architects regional chapter. The Newark Suburban Chapter awarded the Maplewood-based firm the only awards this year for outstanding residential design. In this regional competition, 14 firms submitted multiple entries in four specific categories. The jury awarded a total of seven medals this year, five in non-residential design categories and two in residential design categories. And unlike many competitions, the jury reserved the right to not present any awards if the entries to did not meet strict criteria. The gold and silver medal projects from Clawson Architects were awarded in the “Residential Interior or Feature Element” category. The AIA chapter presented the Gold Medal award for the Clawson firm’s design of the “Stair Hall " The jury’s notes specified the “Stunning transformation and elegant lines.” The home was not a mere renovation but more of a re-invisioned “creation”. The stairs and detail did not exist and are part of a project that included renovations, alterations and an addition. The home is located in Ridgewood, New Jersey. 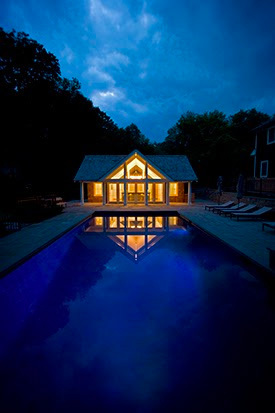 The AIA chapter presented the Silver Medal award for the Clawson firm’s design of the “Nussbaum pool pavilion.” The jury’s notes specified the “restraint and sophistication of the design.” The pool pavilion is a new construction project located in Short Hills, NJ. The Newark Suburban chapter of the AIA presented the awards on Oct. 17, 2013 at a special evening awards dinner at the Morris Museum in Morristown, NJ. It was the organization’s 20th annual awards event. AIA members, sponsors and guests were able to view project boards from the competition, while enjoying food, refreshments and camaraderie. Claire Weisz, AIA is a founding partner of WXY architecture and urban design, a New York City-based firm. Hugh H. Trumbull III, AIA is a senior design principal with Kohn Peterson Fox. Stuart Disston, AIA, LEED GA is a partner in Austin Patterson Disston, specializing in residential design based in Quogue, N.Y. and Southport, CT.
Jack A. Purvis, AIA, principal at the firm that bears his name in Allenwood, NJ,, and is the 2013 President of AIA New Jersey.